The temperatures have soared (in the low 50s today) and all the snow is melting. Funny, how all the stuff that fell on the snow but was covered up again is now showing on top: dust, twigs and leaves, tiny seeds… whatever snow is left now is no longer purely white. But last week, before the thaw set in, Amie and I went for a nature walk with the intention of finding animal tracks. It was cold, but each time we spotted a track in the snow, we grew magically warm. We followed the trails wherever they went, up and down the slopes, underneath the bushes, around the trees, sinking in up to our knees (snow got into my boots: gack!). We were on the trail of one creature in particular. 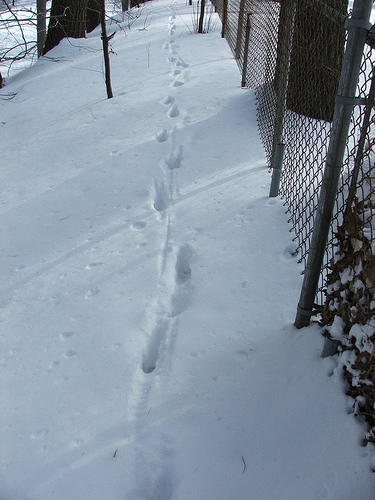 I had found its tracks on an earlier walk and had had a tough time identifying them, because only the trail (the pattern of walking/trotting) was clear, but not the tracks (individual footprints), in the old snow. 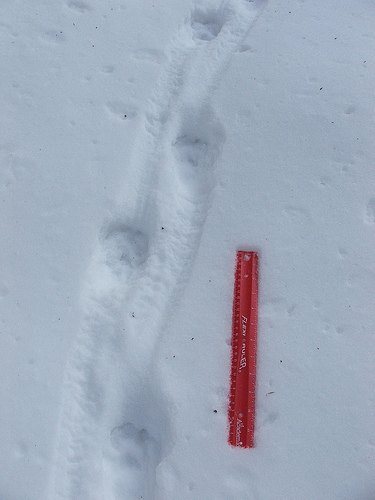 Still, going by Murie’s Animal Tracks my best guess was that they were the tracks of the Red Fox (Vulpes vulpes). I’ve seen this beautiful creature in person only a couple of times, long ago in the summer, so suspecting its signs was exciting. I was keen on getting a good footprint, though, in the freshly fallen snow. This trail is one of a “perfect walker” or an animal with a “direct-register track”: when at a trot, the hind feet step into the tracks made by the fore feet and their trails often form a nearly straight line. Their trails look like the trails humans leave behind – the human animal having only two legs can’t help but be a “perfect walker”! 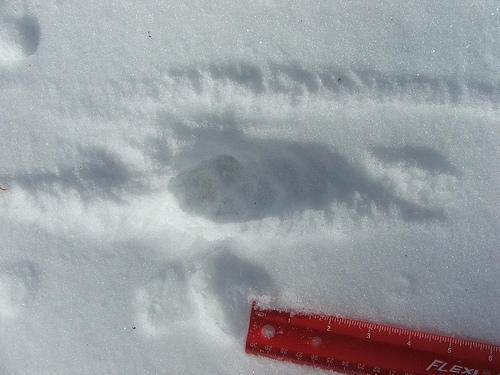 But the fox’s tracks are smaller and closer together: made by a smaller animal. Also, they go places where a human wouldn’t go, like underneath bushes. Domestic cats, bobcats, coyotes, wolves, foxes, deer and moose are perfect walkers. Domestic dogs are not: their trails are more irregular. We don’t have wolves, bobcats, or moose. That leaves deer – of which we’ve seen a few right behind our house – domestics cats, foxes and coyote. Time to look at the tracks themselves. This time the track hadn’t disappeared in the snow and I got some nice photos! Well, that rules out the deer, which has hooves, and the cat (or bobcat, had one wandered quite far out of its range), because cats usually keep their claws retracted, and here the claws can clearly be seen. Fox, then, or coyote. Coyotes have been spotted in the area, but not in our neighborhood that I know of, and I haven’t heard one. Also, the coyote’s direct register tracks are about 14″ to 15″ apart, whereas these were much closer together, about 8.5″ apart. The coyote’s print, with nails, are usually almost around 3″ long, whereas these are only about 2″. The unique and therefore distinguishing feature of a fox’s track, the one that will make all your doubts disappear, is the line or bar that runs across the heel pad of the front track (it can be straight, or chevron-shaped). None of my tracks were clear enough, though. The snow was very powdery and quite deep, which may account for “slurring” of the tracks in those pronounced lines from one track to the other. Sometimes they seemed to have been foot drag, sometimes they seem to have been made by the fox’s tail. I explained all of this to Amie, some of it at a whisper, while we were walking, but most of it back at home, while looking in the track books from the library together. 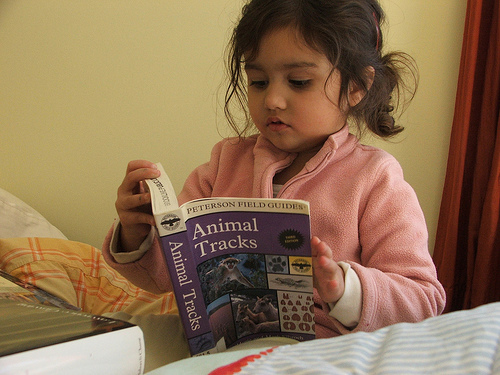 I was interested in identifying the track, of course, and talking about how the signs of animals make them alive for us, even though they’re not present. But I also wanted to show her how an argument works, but which path of deduction I emphasized the words “caused” and “causes”, “so” and “we conclude”, and “it can’t be this because” and “it must be this because”. She was interested in the detective work and clearly grasped some of the easier steps. For instance, she told me herself, looking at the pictures I had made and the drawings of deer tracks, that it couldn’t be deer. Poll: Why Do/Don’t You Simplify/Prepare in the face of Peak Oil/Global Warming? I love your entry on animal tracks. I know what you are talking about here because I experience it a lot with my boys when we are out on the trail. I thoroughly enjoyed this post. It was so informative. 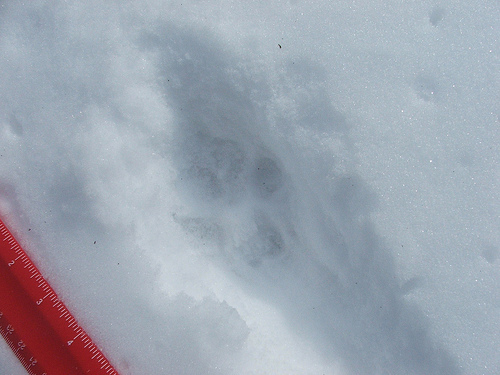 I am so bad at identifying tracks…but I am learning. Wonderful! We don’t have much chance to spot tracks around here, especially in snow, so I loved your post! December 27, 2009 – I was out tracking what I believe to be a fox today on 15 acres of wooded glacial moraines. The animal had a foot like your photos and a tail dragging in the 18″ of snow. I hope you won’t mind if I publish your photo of foot with copyright to blog.bolandbol.com with .jpg identification. I kept a 10 day Eco adventure journal here of my days alone in the Great North Woods of Wisconsin. I am cabin sitting with Sadie, a sweet corge, and had the opportunity to explore the land across the way. Mary Ellen, no problem about using the photos. I’m happy they come in handy for identifying your fox. I glanced at your blog – will read more later – and you seem to be having a great adventure! Thanks for copyright permission. We have had a few folks who were interesed in this saga and have been reading the blog on the 10 day Eco Adventure in Wisconsin. 2010-02-01 Researching tracks with the tail drag line and found this in google images. Turns out your blog is great. So comforting and warming. I teach outdoor ed to preschoolers and relate to your experience with your daughter. Young children get it. This time I am trying to uncover whose tracks in a photo my daughter,(19) took in the snow on the Northern Neck of Virginia this weekend.